A holiday home for any season… in a sunny and quiet position! We offer a cosy guesthouse for relaxing, enjoying and well-feeling during your most beautiful days of the year! 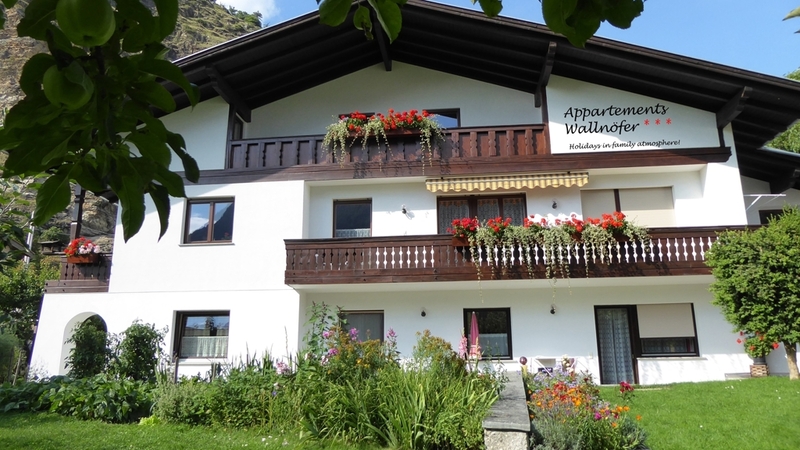 Welcome to the Apartments Wallnöfer in Mals – Vinschgau! The Apartments Wallnöfer are ideal for holiday in South Tyrol at any season. In our inviting house, you spend relaxing days, surrounded by a familiar atmosphere. We are located in a quiet position in Laatsch-Laudes, on 1000 m, in proximity to Mals in Vinschgau. Our guests are offered 3 types of apartments, among 45 and 100 m², which are suitable for up to 6 persons. The apartments are furnished in the Tyrolean style and offer a balcony or private access to the garden. In our village you can find everything you need for your holidays: a bank, a food shop and a baker. As well, there are a pizzeria, bars and restaurants. In summer, hiking lovers look forward to countless hiking paths with various degrees of difficulty, situated in the beautiful Vinschgau mountain world. Hiking, biking, swimming, tennis or fishing are just some of the numerous holiday activities. Culture lovers are recommended a visit in the folkloristic museum in Laatsch, in Glurns, at Castle Marienberg, Churburg and in the numerous churches in the environs. In winter, the skiing areas of Watles, Schöneben, Haideralm and Sulden just wait to be discovered. We are looking forwards to welcoming you soon!